The future of biodiversity, including the Asian elephant, depends on the value we place on wildlife and wild places. It matters not how to save biodiversity if people do not value it. As visitors stroll through Elephant Reserve, they will encounter six different viewpoints that illustrate some values concerning wildlife and wild places. A designated national historic landmark constructed in 1906, the Elephant House was renovated and transformed into the Vanishing Giants exhibit in 2000 and then re-named Elephant Reserve in 2009. The Taj Mahal-like building is one of the most popular sites of the Zoo and home to the Asian elephant. Keeper Cecil Jackson introduces our Asian elephants. 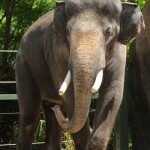 Check our animal encounter schedule for elephant keeper talks. 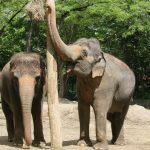 Do you want to test your knowledge with the elephant name game? Click here!